What about this dream match? The Road to WrestleMania 35 has picked up some great momentum recently. With the return of WWE's Big Dog, Roman Reigns, and the Animal, Batista, things have become intriguing than what they were a couple of weeks ago. While Lynch, Rousey, and Flair have still been stealing the limelight, dropping classic moments one after the other, the rest of the card is building up quite well. Here, we present 3 matches that have come up very recently through the rumor mills recently, that should happen at WrestleMania 35. Whether John Cena has taken The Undertaker's place as the Superstar who everyone wants to face on the Grandest Stage Of Them All is debatable. However, he has certainly taken The Phenom's place as the Superstar about whom rumors of a possible 'Mania match just doesn't end. The speculations over The Cenation Leader's WrestleMania match have been endless. It started with Lars Sullivan, who suffered an unfortunate Anxiety Attack. Then, Drew McIntyre became the Cenation's leader probable WrestleMania opponent. However, the latest rumor may have sealed Cena's fate at 'Mania. Rumors have begun to float that John Cena will fight Samoa Joe for the WWE US Championship on April 7. Samoa Joe recently answered R Truth's Open Challenge and won the US Championship by defeating R-Truth, Rey Mysterio and Andrade in a Fatal Four-way match. 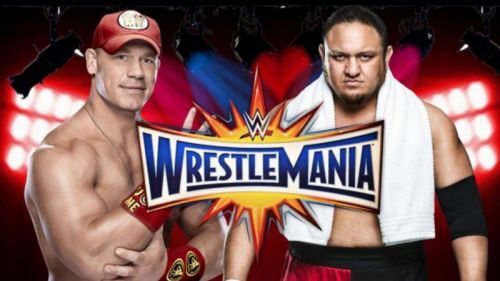 And, reports suggest that if things don't change again, we might very well be up for a dream fight: Samoa Joe vs. John Cena. While McIntyre vs Cena would have undoubtedly been a great match, The match against Joe won't be anything less than epic. The two men are awesome competitors and will put on a match worthy of the big stage. Moreover, fans have wanted for Joe and Cena to cross paths for a long time and considering Cena's reducing WWE appearances, there may not be many opportunities for these two to tangle on such a big stage. Cena is currently filming for his upcoming movie "Playing With Fire" in Canada, but the shooting finishes before WrestleMania, and he will fight on the show. And, if he faces Joe, nobody will have any complaints.